Over the past few years, it is observed that advancements in medical image technologies are increasing the demand for dental X-ray systems. The dental X-ray systems and cone-beam computed tomography (CBCT) systems, are designed to treat oral problems. In recent years, a CBCT system is considered as the most practical method of providing diagnostic tools like surgical guides, mandibular canal location, and pre-surgical treatment planning with 3D dental software applications for dental disorders. Floor mounted intraoral X-ray systems and hand-held intraoral x-ray systems are considered as intraoral X-ray systems, whereas, panoramic x-ray systems and cephalometric projections systems are considered as extraoral X-ray systems. In intraoral X-rays systems, the X-ray film is placed inside the buccal cavity. Intraoral X-rays systems allow dentists to observe roots of the teeth, check the condition of the bony region surrounding the tooth, monitor the condition of developing teeth, and detect cavities. Extraoral X-ray systems are used with the film outside the buccal cavity. Extraoral X-ray provides less detail in comparison to intraoral X-rays. Extraoral X-ray systems are used to examine the bones of the face. The report classifies the global dental X-ray systems market by product type, end-user, and regions. The report provides market size and forecast for dental X-ray systems. The report analyses the demand for dental X-ray systems from dental laboratories, dental hospitals, dental clinics and others. In terms of revenue, the global Dental X-ray systems market is projected to expand at 6.4% CAGR over the forecast period of 2018–2026. The dental X-ray systems market is expected to be valued at US$ 2,978.2 Mn by 2026 end. The introduction of technologically advanced and new innovative medical imaging devices are expected to boost the growth of the global dental X-ray systems market over the forecast period. By country, the U.S. is expected to dominate the North America dental X-ray systems market with a lucrative growth over the forecast period. Growing incidence of oral cancer with an increasing number of dental procedures are the major factor anticipated to drive the growth of the global dental X-ray systems market over the forecast period. Moreover, the increasing demand for technologically advanced dental X-ray systems for better treatment is also projected to drive the growth of dental X-ray systems market over the forecast period. In addition, growing adoption and rising demand for dental X-ray systems in dental hospital and clinics, coupled with socio-economic factors such as increasing dental disorders are also increasing the growth of the dental X-ray systems market globally. Government initiatives to provide low-cost dental treatment in low-middle income countries is also expected to propel the growth of the dental X-ray systems market. 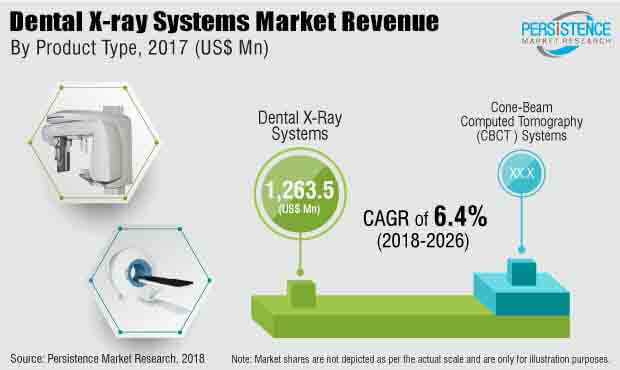 However, reduced reimbursement and primary healthcare facilities with limited capacity and resources are major factors expected to restrain the growth of the global dental X-ray systems market over the forecast period. For instance, from 2018, the costs for imaging studies performed on computed radiography devices will be reduced by around 7% for the following five years, and 10% after that. The new legislation will impose reimbursement cuts to the technical components for X-rays performed on older technology. The reductions apply to both the Hospital Outpatient Prospective Payment System (HOPPS) and Medicare Physician Fee Schedule (MPFS). This reduced reimbursement for computed radiology equipment is expected to hamper the growth of the global dental X-ray systems market. Geographically, the global dental X-ray systems market is segmented into viz. North America, Latin America, Europe, APEC (Asia-Pacific excluding China), China, and the Middle East & Africa (MEA). In terms of value, North America was the dominant regional market for dental X-ray systems in 2017 and is expected to grow at a CAGR of 5.7% over the forecast period. This is followed by Europe and is the second most dominating region in dental X-ray systems market. Asia Pacific is expected to contribute significant revenue share in the global dental X-ray systems market over the forecast period. However, Latin America and the Middle East and Africa region are expected to witness slow growth in the global market for dental X-ray systems. Examples of some of the key players identified in the global dental X-ray systems market are Danaher Corporation, Dentsply Sirona, J. MORITA CORP., FONA, Carestream Dental, LLC., Prexion Corporation, PLANMECA OY, Owandy Radiology, and others. Major key players are looking for opportunities like geographical expansion which can increase their market share in the global dental X-ray systems market. In addition, adoption of various strategies like mergers, collaboration, acquisition, agreement, and others are observed in dental X-ray systems market by local and emerging payers in order to increase their market presence. Manufacturers are also focusing on research and development activities to develop technologically advanced dental X-ray systems.